Merilou has been a practicing artist and teacher for over 40 years journeying through different materials, media, influences and forms. With each sojourn into a different media she has discovered new techniques that have made a mark on her work on the road to artistic creation. She utilizes different textures and materials which unite to create unique one of a kind pieces of jewelry. Merilou began her fascination with jewelry in college. She is a California credentialed art teacher with a B.A. as well as a doctorate degree and has been a practicing attorney in the State of California. She has been an exhibiting artist at the Art-A-Fair in Laguna Beach for the past fifteen years and is the recipient of numerous national and local awards for her intricate wire wrapping. She has been selected as an “Illustrious Artist” as well as winning numerous juried competitions. Her work has been featured in publications as well as on the cover of a national magazine. She has taught wire wrapping all over the western United States as well as on a Celebrity cruise ship in Alaska in 2013. 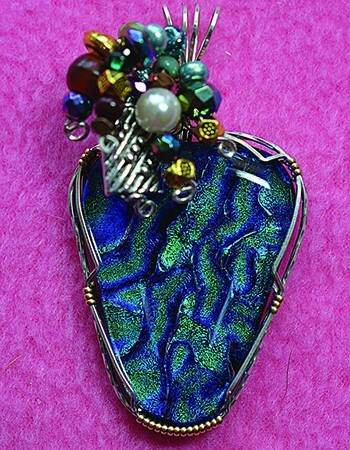 She currently works with dichroic glass which is cut, layered, fused, cold worked and fired in stunning color combinations. Natural gems and stones, fossils and pearls are also intricately wire wrapped or sculpted in wire with 14K gold fill and/or sterling silver wire producing fine jewelry superbly crafted and filled with detail and drama. Merilou will also be offering jewelry making tools, instruction books, kits as well as workshops.